“Army-Navy” General Dwight D. Eisenhower 1915 once said, “The Army and the Navy are the best of friends in the world 364½ days a year, but on one Saturday afternoon, we’re the worst of enemies.” The storied rivalry, which began in 1890 and has been ongoing annually since 1930, is teeming with traditions no other college football game can tackle. 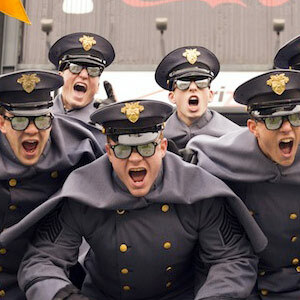 The week before the game, West Point has mandatory battle dress uniforms, the Goat-Engineer game, the pep rally, the spirit of the Twelfth Man, the bonfire, and the burning boat. At the game, there is the “march-on,” the “prisoner” exchange, the Mule and the Goat, spirit spots, and the singing of the alma maters. Some rivalries are in-state (Alabama-Auburn), some are regional (Michigan-Ohio State), but with its graduates serving all over the globe Army-Navy is a world-wide rivalry. MacArthur telegraph to Red Blaik about stopping WW II to celebrate Army’s 1944 victory over Navy: “The greatest of all Army teams - STOP - We have stopped the war to celebrate your magnificent success."